Telcos are steadily turning to aggressive cost-cutting strategies in an effort to boost struggling bottomlines brought about by the looming market entry of mobile operator TPG, according to DBS Group Research. StarHub's profits are forecasted to grow the slowest CAGR growth of 4% from 2018-2020, analyst Sachin Mittal said in a research note. A separate report by UOB Kay Hian notes that the telco's aggressive operational efficiency programme is expected to generate $210m in savings over the next few years that could prop up its weakening businesses. The savings would largely be generated from streamlining StarHub’s organisational structure to make it leaner and more agile as StarHub aims to trim its workforce by 12% and the one-off restructuring costs are said to be at $25m. Singtel earnings are poised to expand at a faster pace with a CAGR of 7%. 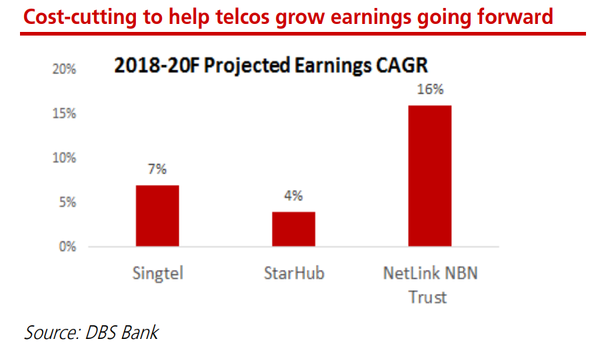 Similarly, NetLink NBN Trust earnings are expected to book the largest CAGR of 16% from 2018-2020 given the continued importance of NBAP connections. "Netlink (NLT) is our top pick in the sector and is attractive for its 6.6% yield. We argue that NLT should trade at a tighter spread than S-REITs and is likely to benefit from front-loading of revenue from StarHub’s accelerated fibre migration," added Mittal. Netlink is expected to weather the entry of the fourth mobile operator as TPG Telecom actually relies on NetLink's N NBAP connections for backhaul transmissions, added UOBKH. TPG is expected to require NBAP connections for 3,000 base stations over the next three years, a demand that is poised to grow with the advent of 5G.